Here is a simple fly I tie called the Peacock Nymph. I think all my fly boxes are filled with what you call stupid flies. lol. Seriously, my most complicated nymph is something like a Rainbow Warrior, and with just three materials and a handful of steps, it's a breeze to tie and not too painful to lose. All of my nymphs are like that. I guess my dries are the same -- just a few materials. I used to tie full out Parachute Madam X flies (kinda complicated), but even those I've simplified. My streamers are simple, like the ones you listed. Probably the most complicated fly in my box is a Headbanger. 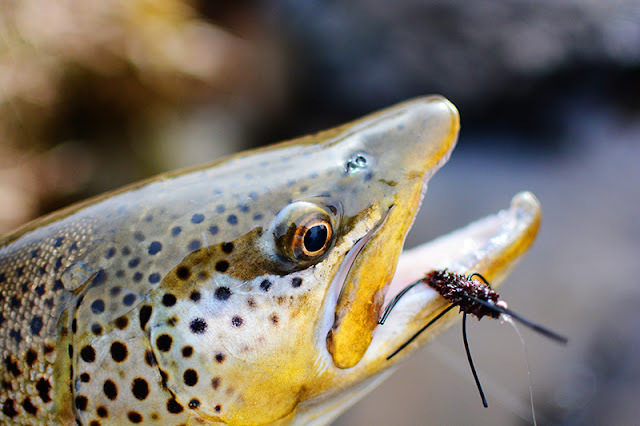 I know that some tiers want to add things to a fly, hoping that the material addition will attract a trout -- to give them something else that convinces them to eat. My theory on flies is that trout are looking for reasons NOT to take my fly. I think fewer materials give them less to reject. Thanks Dom. I think you're really onto something with your theory. It would certainly explain why fish refuse flies so often. (I try not to think of all the unseen refusals). I'm curious, what led you think that way? I love stupid flies. Adams or a stimulator on top, hare's ear, pheasant tail, zebra midge, or San Juan worm below. Can't go wrong with a wooly bugger or minnow. I actually got behind a fly-tying vise for the first time in my life this month and I have a newfound respect for tyers! The stupid flies are quite a challenge for me right now, but I can imagine I'd like to tie some prettier flies in the future, probably more for me than the fish. Careful Daniel, fly tying is a slippery slope! It's a blast, but pretty unlikely to save one much money like we usually try to convince ourselves it will. Look forward to hearing about your creations. Thanks, ya, not expecting to save any dough. Just thought it'd be a cool way to connect with what I'm doing a bit more!